So what kind of occupation is an адвокат? Well, when the police arrest a suspect in the U.S., they must inform him that he has the right to remain silent, and that he has the right to hire an адвокат. To put it another way: The person you hire to represent you in court is called your адвокат. So адвокат is the Russian word for lawyer. It sounds like advocate, which is what a lawyer is, right? He’s an advocate for your rights and your side of the story. Just note how the emphasis is on the end of the word. адвоКАТ. Say: My Dad is a lawyer. Alright, now let’s do some review. What Russian word do we use to greet people? Say: My name is George. Say: This is my dad. He’s a lawyer. Это мой папа. Он – адвокат. Try saying: My dad is an American, whereas my mom is an Englishwoman. Мой папа – американец, а моя мама – англичанка. This is my friend. He’s an Australian. Это мой друг. Он – австралиец. This is my female friend. She is an American. Это моя подруга. Она – американка. Это твой друг Джэйсон, да? So, KTO is one of the Russian words for “who”? The word is spelled with just three letters: A “K” a “T” and an “O”. So ask someone: Who is this? As we did in the last podcast, I want to show you how that little word “ah” works in Russian. (Vlad) Кто это? Твой друг Стив, да? (Vlad) (pointing to a girl) А кто это? Who is this? Your mom, yes? Кто это? Твоя мама, да? And who is this? Your dad? А кто это? Твой папа? Did you add the “ah” sound at the beginning? By putting the question word last, we’re placing more importance on it. Again, word order is one of those things I’ll be pointing out as we go. Then Uncle Tolik pours a clear liquid into your shotglass. Ask him..
Did you add the “ah” at the beginning? So, ИКРА is the Russian word for caviar. Say that again: Eek, raw fish eggs! I call that kind of mnemonic device a PowerPhrase and they’re a great tool for quickly memorizing a ton of words. When I was first learning Russian I made a PowerPhrase for just about every new word I learned. It’s amazing how much you can remember that way. And I use those same ones in our Russian Accelerator videos, along with funny pictures to really drive home each phrase. The visual part is really important, and it’s a limitation of an audio-only format. Because you really want to associate an image with each PowerPhrase….that helps to make it memorable. These kinds of mnemonic devices are used by all memory experts and advanced language students. Ask anyone who’s learned a 2nd or 3rd language quickly, and they’ll admit they used these kinds of memorable phrases to help them recall words. This is my friend Pavel. He is a businessman. Это мой друг Павел. Он – бизнесмен. If you know the meaning of this word say, ДА …I know it. If you don’t, then say НЕТ I don’t know it. So, Да and НЕТ are opposites. Да means YES and НЕТ means No. Tell her: No, this is Kevin. She asks: Is he a businessman? Tell her: No, he’s an engineer. So, practice asking these questions as you go about your day. 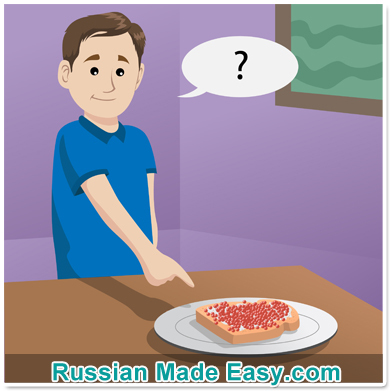 In the next episode we’ll learn how to order food and drinks….certainly a useful thing to know…and we’ll learn how to develop fluency in Russian. Yes, even beginners should be working towards fluency right from the start. And I’ll show you how, in the next episode. Meanwhile, head over to RussianMadeEasy.com for today’s downloads. Hi Mark, I really love your course! It’s brilliant and I am recommending it to everyone who asks and even to those who don’t. “Моя” папа and not “мой папа”. Please help! Apparently this was a typo that has since been corrected. This is perfect!!! I am enjoying every podcast that is listed. Do you have others. From intermediate to advanced? Thank you very much!!! Thanks, Diane. The podcast acts a primer for my comprehensive video course called ‘Russian Accelerator’. Hi Mark, Excellent podcast – I can’t stop listening to it. I have a few questions accumulted until this lesson, can you help? 1. I’ve noticed that many words in their feminine version change the sound of an O to A – is there a rule for this? for example он sounds like “on” but она sounds like “Ana”, similar with Эtо, моя, Твоя, etc. 2. When it comes to nationalities, it seems that male nationalities end with ец and females with ка – except for Englishment! which end in ин – is that an exception? Glad you’re enjoying the podcasts! 1. The Russian letter ‘o’ when unstressed, sounds like an “ah” or “uh” sound. 2. Yes, the ИН ending for Englishman is a less common pattern than the ЕЦ for nationalities. 3. This is a more involed question than space/time warrant here. Hopefully you’ll join my Russian Accelerator video course where we cover this in great detail. I have to say, though I’m only on lesson 5 here, I am thoroughly enjoying the Russian Made Easy program! Thank you for making these lessons available for free – as I am trying to figure out the best program to learn from, I appreciate being able to REALLY try out your program without having to actually buy anything before I have an idea of whether I will like and be able to learn from it. It’s so frustrating to get just a few steps in to a program then be hit with “if you want more, you can purchase the rest of the program for…..”. Ugh! I plan to continue on to the next couple of lessons before signing up for the Russian Accelerator program but I did want to send a quick shout-out to say that so far, I am FINALLY beginning to feel like I’m getting a handle on learning Russian and feel like I actually CAN learn Russian! Thanks and I’m looking forward to learning more! Wow, thanks so much for the kind words. So glad you’re enjoying my podcast! as you go through the podcast, be sure to make those flashcards, and let me know how you do on the mid-term and final! Well, I tried a popular online language program and then, at the library, picked up a set of a popular Russian language learning CDs. Last week, I decided I needed to commit and was going ahead and ordering the CDs (purchasing online). Before I decided on going ahead with buying the CD set, I decided to do ONE LAST look around…While checking reviews, comments, doing more research and considering the options, “BOOM!” I came upon YOUR program!!! Here I am, on Lesson 5. I have been using your lessons for one week and have learned MUCH more than I had after a few WEEKS with the others. I have had a similar experience to others who have commented above: it’s fun, you are great and I am making progress–SO exciting! –Recognizing that the student CAN–and then MOTIVATING the student to–solve the problem/figure things out makes a HUGE difference in learning! –You, as our teacher, are very encouraging and supportive, which is SUCH a crucial component in language learning! Thanks for your hard work to put this together and sharing your knowledge with us, Mark! Wow, thanks so much for the enthusiastic support. 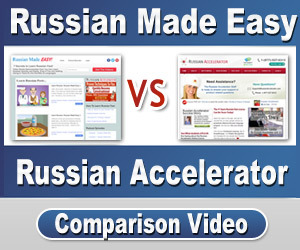 I hope to see you in my video-based ‘Russian Accelerator’ after you finish RME. So my story is a bit involved, but I wanted to say thank you right up front, this is very much the course I have been looking for. I actually learned a fair bit of Russian as a child, there was a huge immigrant population and I wanted to be able to play with my friends that didn’t speak English all that well. That led my to a lifetime of studying languages, with at one point having a working fluency (Not a full on speaker per se, but understandable) in about 9 languages. This became very useful when I decided to join the military, a skill set I would use a lot. However, I found that while I learned quickly I wouldn’t retain a language well. I would later learn it was because my brain and mind learning style was not being engaged properly. I have since left the service after a long and interesting career, and now work in Alaska where, as I am sure you are not surprised, there is a large russian speaking population. Being the first foreign language I learned this has been a welcome challenge and I’m finding it much easier to retain now with how you teach. Knowing some of the psychological tools behind your method I have to say that you put together very clear, effective lessons that are immediately useful, usable, and retainable. I will move on to the rest of your classes as I get through these podcasts, I am very excited to develop a greater fluency than I have had in the past. Thank you. Thanks, William. Having a grasp on nine languages is a heck of an achievement! Looking forward to welcoming you to Russian Accelerator.